Right besides a picturesque bend in the Rio Douro, in the green and fertile Douro valley, Pinhão is a rather cute town and, perhaps more importantly, a wonderful wine centre. Because the reasons to visit Pinhão aren’t actually centred around Pinhão itself, some of our Guru’s recommendations for the best places to stay in Pinhão are actually in amongst the vines in the valley or in smaller neighbouring towns. Port is the main tipple produced here, but there’s plenty of variety to taste, at the cellar doors, or in the beautiful bars on the riverside promenade. As with many wine regions, Pinhão is also a very good spot for those with an interest in food. The lush surroundings make it perfect for walkers. And anyone looking for a peaceful corner or the world to just relax in. If you have a car there are some truly scenic drives in the region, and it’s certainly worth seeing the valley from the river as well. Our pick of the best places to stay in Pinhão are all perfect bases from which to explore this beautiful region. Vintage House Hotel is a 43 room hotel beautifully converted from an 18th century wine estate. The location is superb and the rooms are elegant and comfortable, plus there’s a characterful restaurant serving local cuisine. 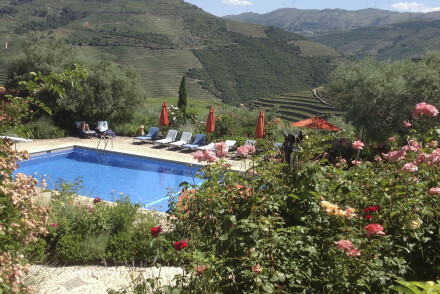 The Casa do Visconde de Chanceleiros is a beautiful, traditional farmhouse in an incredible location with wonderful valley views, now converted into a rustic hotel. There’s a sunny terrace and pool, gardens filled with lavender, plus a restaurant serving excellent traditional food. The Casa de Vilarinho de Sao Romao, in nearby Sabrosa, is a traditional, six room quinta with colonial style rooms offering magical views over the surrounding vineyards. Have breakfast on the terrace or by the pool. Rooms start from around €85 per night. Also in Sabrosa, or just outside, the Casa das Pipas is an authentic, ten room guesthouse with great vineyard views and a superb restaurant. Rooms start from around €95 per night. The Quinta do Vallado is a rather splendid 18th century country house with a working vineyard and 13 contemporary chic rooms. There’s also a pool and an excellent restaurant. Rooms start from around €114 per night, and they also have some great accommodation for families. We recommend exploring the options at our online partner Booking.com. The nearest airport to Pinhão is Porto (59 miles) and a scenic train runs directly to Pinhão. If you're looking to hire a car, we recommend visiting our online partner Rentalcars. The best time to visit Pinhão is from May to September, when the temperatures sit comfortably in the twenties. Browse through our list of all the best places to stay in Pinhão. Expand your search to include our Porto recommendations. A beautiful Portugese farmhouse in a stunning location. Wonderful valley views over the Douro from sunny terraces and lavender filled gardens. 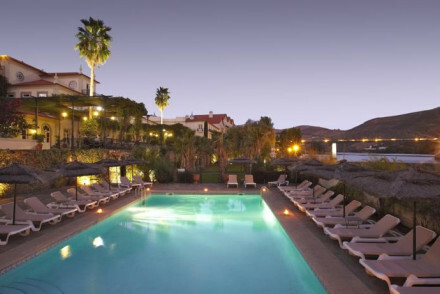 Romantic rustic bedrooms with patios, excellent traditional food, and a large swimming pool. Romantic, relaxing, family friendly too. Views - Beautiful valley views. Set in a glorious former 18th century wine estate, Vintage House Hotel marries the winning combination of a great location with excellent hotel service. The elegant rooms are comfortable, and the Rabelo Restaurant is full of character with it's vaulted ceilings and regional cuisine. A riverside gem. Local exploring - The ideal base for exploring the stunning Port region of Douro, with tonnes of expert advise and local knowledge. Romantic Break - A tranquil riverside spot amidst rolling wine country, perfect for a romantic break. Sights nearby - History buffs must check out the stunning nearby Mateus Palace.